"The flavor of potato gnocchi is lifted by this sweet, fresh, spicy sauce." Heat olive oil in a large saucepan over medium heat. Stir in the onion, garlic, and chile pepper; cook until the onion has softened and turned translucent, about 5 minutes. Increase heat to medium-high, and stir in the cherry tomatoes. Cook until the tomatoes have lost their form and are beginning to make a sauce, about 5 minutes. Stir in the crushed tomatoes, bring to a simmer, then reduce heat to medium-low and cook for 10 minutes. While the sauce is simmering, bring a large pot of lightly salted water to a boil over high heat. Add the fresh gnocchi, and cook until the gnocchi float to the surface, 2 to 3 minutes. Gently strain out the gnocchi and place into a serving dish. Stir the basil and olives into the simmering sauce, and cook for one minute. Pour the sauce over the drained gnocchi and sprinkle with Parmesan cheese to serve. Watch Chef John prepare a sensational long-simmering meat sauce. This was an easy recipe. Light and delicious. I didn't add the chile (kids don't like it). Would make this again and again. I omitted the crushed tomatoes and it was still tasty. Thanks for sharing! What a great way to use all those cherry tomatoes from the garden. Different than our usual tomato sauce and really tasty. Good, but not out of this world. The olives really make the recipe. 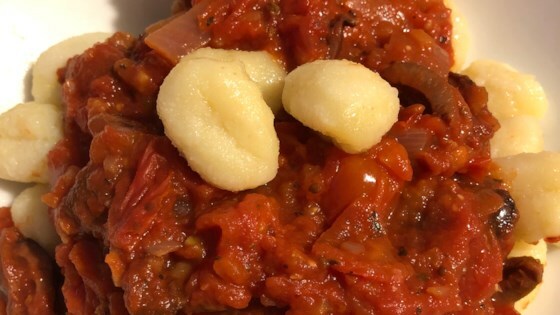 Good Gnocchi recipe and will use again.